And I am fine (better than) most of the time – but that is thanks to my teachers along the way and to myself for all the steps I’ve put in place over the years to continuously improve my health. It’s something I’ve taken responsibility for, and that is incredibly empowering, liberating and rewarding. A genuine health practitioner does walk the walk, however that does not mean we are immune to all the challenges life throws our way. In fact many health practitioners I know are in their chosen profession thanks to a history of ill health that they have managed to resolve. Health is not just the absence of disease. It is an intricate web of physical, mental, emotional and spiritual wellbeing – even the WHO agrees with me on that one. And so, being human (news flash!) I have my ups and downs too and it is through determination (even if it wavers at times) and persistence that I, like you, surmount my challenges. I know the feelings of frustration when you reach a plateau in your progress. Where you feel like you’ve come up against a brick wall. Where you want to hurry up the process and get to the destination without having to complete the journey. At such times comes the incredibly powerful (even if cliché sounding) lesson of living in the present moment, and taking one step at a time. Why am I writing about this now? Week three of my running program and I have hit a challenge spot – physically and emotionally. Most bits of me from hips down feels tight and or sore and I experienced a lot of pain walking don Mt Vic over the weekend (not a good feeling when you want to be able to walk down the much bigger Himalayas). I’ve not run for five days now as I try to do more stretching and strengthening work. On top of that I’ve had some major life changes recently. As I find my feet, a new balance and review my identity of myself there are minutes, hours or days (depending on the given time) that everything can seem a bit much to handle. And so living in the present moment has become a muscle I’ve been exercising particularly well lately. So my advice to you is this. Have an end goal, keep it in mind, but don’t worry about it. Look at where you are now, be grateful for that and for the tools and knowledge you have and then just take the next step. 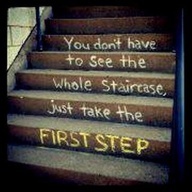 Just one step. No matter how small. Have a glass of (filtered or spring) water. If you’re already doing that, add a pinch of sea salt and or a squeeze of fresh lemon to it. Honour yourself with a good breakfast. Go to bed 10 minutes earlier. Meditate for 2 minutes. Talk to friends. Write down what you are grateful for. Get help from a health professional. Don your running (or yoga or swimming or…) gear and get out the door. Myself, I am very grateful that I have the means to spend my time between two beautiful cities, with beautiful friends and family. I love that I love my work, that I get to help others on a daily basis, that I have access to real food and great support from a team of excellent health professionals. This week I’ve had a great physio session with Gayle and a training session with Carl learning different exercises that are associated with different emotional states – once again drawing the line between emotional and physical health. And so I take my next step – more core work from Gayle and Carl!